A simple, easy dinner was in order this night. Doesn't everyone like tomato soup and grilled cheese? I have made a tomato soup Roasted Garlic and Herb Focaccia Sticksfrom scratch before, but I wanted to try this one too. After reading some reviews on it, I adapted it to our liking, I also changed the amount it feeds (to 6) there on the site since it figures it all out for you. I used my immersion blender and blended for a good 5 minutes so it was creamy texture. I tried a little in the regular blender, but it still almost blew up (too hot!). I didn't want the half & half to overpower the tomato flavor and beautiful red color, so I only added in a little. Anyways, I thought this was fabulous! Everyone ate it (well my 7 yr old didn't like the smell of the fresh basil plant, so she was being picky about that). 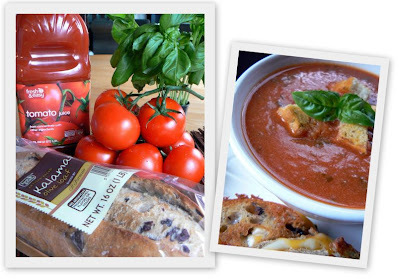 This is a tangy tomato soup, so you could add a little more sugar to cut the acid in it. In fact, I liked this recipe better than the other one I posted about. 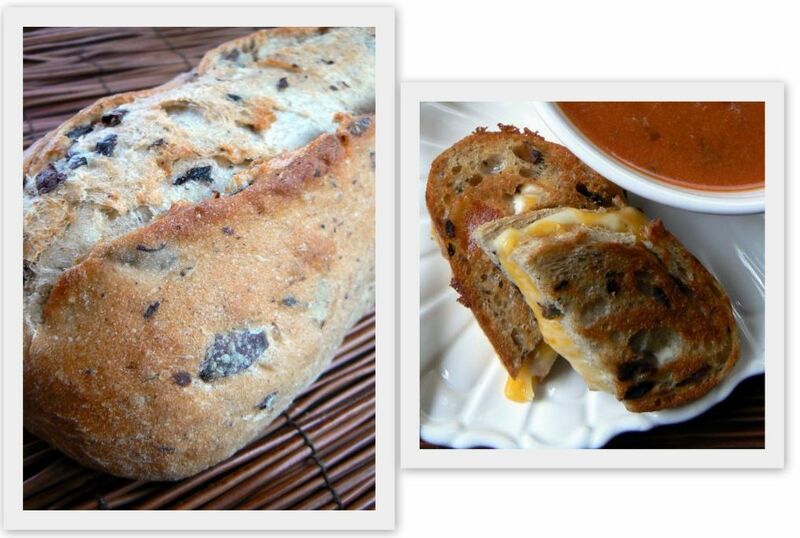 I picked up an olive loaf of bread and made grilled cheese sandwiches with that. I topped the soup with some broken pieces of Roasted Garlic and Herb Focaccia Sticks. Place tomatoes and juice in a stock pot over medium heat. Simmer for 2 hours. Puree (I used my immersion blender, be extra careful if you use a regular blender!) the tomato mixture along with the basil leaves, in the stock pot. Keep the pot over low heat, and stir in the heavy cream and butter. Season with salt and pepper. Heat, stirring until the butter is melted. Do not boil. Place both slices of bread (per sandwich), buttered side down, on a hot griddle or pan. Add cheeses, let the cheeses melt and the bread turn golden (griddle like an open face sandwich). Then flip the top slice onto the bottom slice. Serve hot. Love your combination of cheeses in the sandwich and that pretty olive bread. Those immersion blenders are great aren't they? One of my favorite meals - tomato soup & cheese! Wish I had that meal right now. looks very delicious! loving the blog~ great posts and pics! Oh my gosh--this looks SO GOOD! Definitely something to try when I get so many tomatoes from the garden. Thanks for the recipe! Confort food at its best!!! Hello. My husband actually made this a couple weeks ago. It was simple and very tasty. We didn't have fancy bread on hand, but cracked wheat worked great. We used pepperjack cheese on the sandwiches.